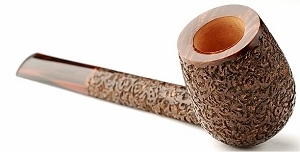 Sergey Ailarov is one of the most interesting and most successful pipemakers from Russia. 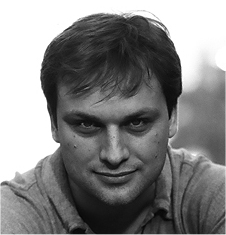 Sergey was born in Vladikavkaz, Russia in 1973. He was taught the art and expressing his creativity since his youth. He studied in Vladikavkaz jazz guitarre and composition. In the age of 25 he decided to leave his house in the Caucasus and to move to Moscow. He intended to follow the art of photography, for which he had developed a great passion in the meantime, in Moscow. For his 30th birthday Sergey Ailarov got given a pipe. A new passion started, collecting pipes. And the fascination leads him to try to make pipes himself. How many others, he started with drilled hobby blocks. This was the beginning of his new profession. With the happy circumstance to became a pipe smoker, Sergey has transformed all of his fine Arts experiences into what he believes beeing a very practical and creative form of Art, Pipe making! Balance, quality of the grain and practical technology are obviously seen in his work. His art expressing completely in a shape which can be enjoyed by all senses. He starts the manufacturing process with repeated outlines and scetches until the shape completely corresponds to his intentions. 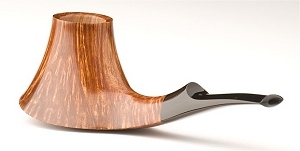 He starts with a clear idea of the shape to work on the Briar. "If we talk about pipe production in the context of the art and the creative work, then any hand manufactured pipe is the expression of the feeling of the pipemaker and his efforts to represent the beauty of the material optimally of aesthetic. The discussion is not erroneous as long as different production engineerings hide behind this " classic vs. freehand ". But every pipemaker has only one unique heart but not two single ones. 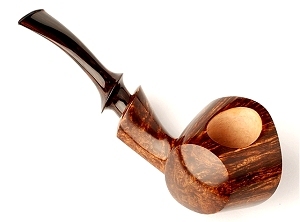 If the pipemaker sits down to make a pipe, it does not care, whether a rather classic or rather free form comes out at the end. He will have followed the dictation of his heart in every case. 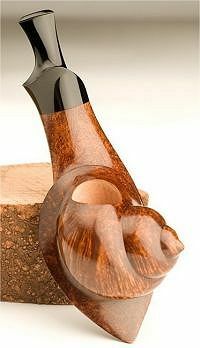 And the talent reveals itself in every case but not after that, for what a pipe shape the carver has produced. Free hand shapes are usually more laborious but a Billard demands to give up a deep part of intellectual and emotional strengths, what needs discipline ".